If you follow SimplyLKJ on Instagram then you caught a glimpse of this dish on Friday. As promised I am posting the recipe today. The recipe comes from Ina Garten's (Barefoot Contessa) FOOLPROOF cookbook. I love this cookbook. The recipes within are very simple, with few ingredients. Perfect for a busy weeknight. Heat the olive oil in a large (12 inch) saute pan over medium heat. Add the fennel and saute for 5 minutes, until tender but not browned. Turn the heat to medium-low, add the garlic and red pepper flakes, and cook at a very low sizzle for 2 to 3 minutes, until the garlic just begins to color. Pat the shrimp dry with paper towels, add them to the pan, and toss together with the fennel and olive oil. Spread the shrimp in one layer and cook over medium heat for 2 minutes on on side. Turn the shrimp and cook for 2 minutes on the other side, until they're pink and just cooked through (may not take as long if using the cocktail shrimp). Off the heat, sprinkle with parsley, 1 tablespoon of chopped fennel fronds, the Pernod (if using), the fleur de sel, and black pepper and serve it with bread to soak up all the pan juices. We chose to serve it with sauteed spinach. I had frozen on hand, but you can use fresh as well. Just heat a bit of olive oil and butter along with minced garlic (about a tablespoon or so depending on taste), let the butter melt then saute the spinach until heated through (if using frozen) or until wilted (if using fresh). The spinach was the perfect compliment to the shrimp dish. I hope everyone enjoyed the long holiday weekend. I know we did. So happy to see the sun shining again, and the temps were in the 60s! Hubby and I decided to get out and get some fresh air. On Saturday, we headed into Virginia Highlands to wander through the local shops and grab a bite to eat for lunch. I was thrilled when we stumbled upon a quaint store full of candles (all marked 30-50% off). I had pretty much depleted our supply over the holidays. 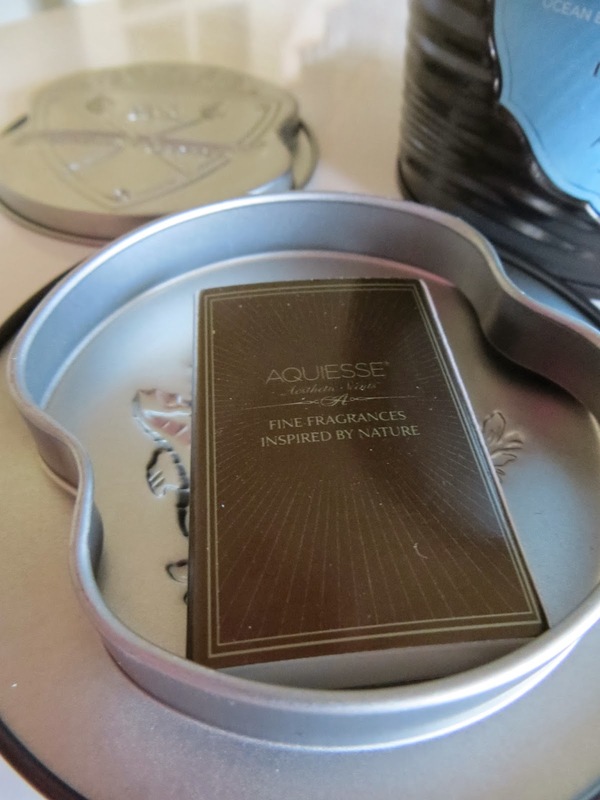 Shoreline by Aquisse (Ocean Breeze, Coastal Flowers, Drenched Wood), Gullah southern botanical perfumed soy candle (magnolia, gardenia, amercian holly, clean musks, exotic bensoin resin, and a warm backround of sweet vanilla and oak wood), Paddywax Apothecary (Tobacco & Patchouli). 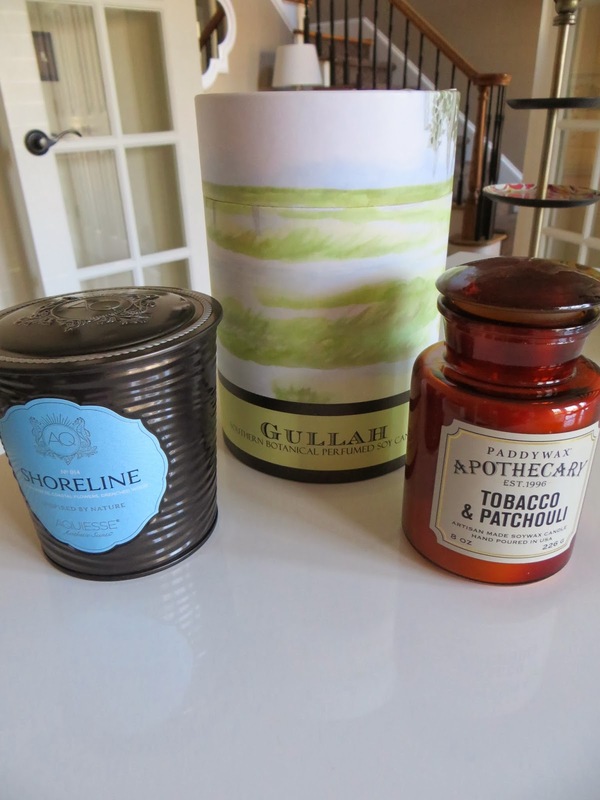 The Gullah candle is part of the Low Country Luxe Collection. They also have Savannah, Charleston, Living in High Cotton, Sea Grass, and Spanish Moss. Perfect gift for a Southern Friend! 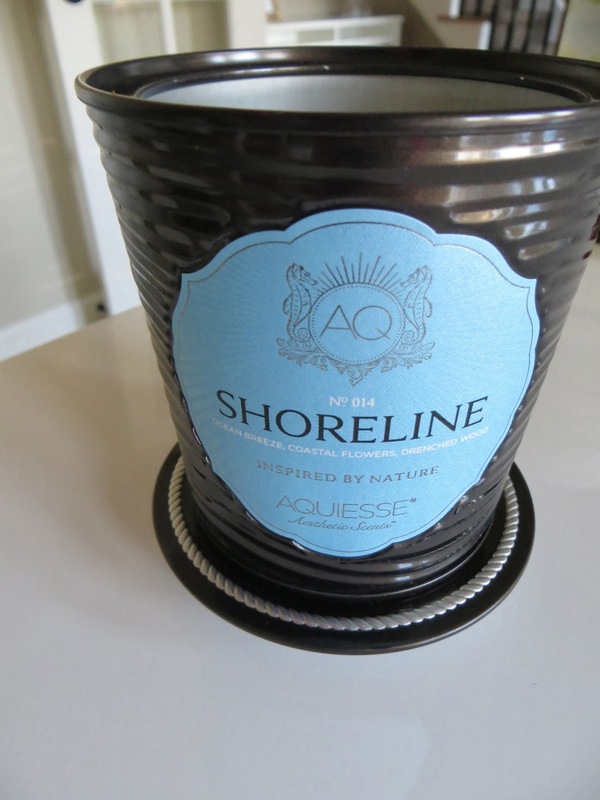 The Shoreline candle is quite unique, as you will see in the following pictures. Once you take the lid off...you will find these underneath a cap. and then...the lid becomes a coaster for the candle!! Apparently we did not get enough fresh air on Saturday (we are making up for a couple weeks of snow and ice after all), so we headed up to Dahlonega for the afternoon after church. First stop, Main Street Burger...we happened to stumble upon this. I was reading the menu outside when a young girl stopped and said, "Miss, their burgers are amazing." And, to my surprise they offered Gluten free buns (however, they were out due to the weather the previous week and not receiving their shipment). Nonetheless, the burgers were amazing as well as the sweet potato fries. They offer a good variety of milkshakes as well. Great place to take the kiddos if you are up that way. I can see why the college kids at North Georgia love it! We strolled around the town, stopping in a few stops. The last was a larger antique market. I was thrilled to stumble upon this Royal Albert Plate. One in a series of "A Man's Best Friend" collection. You see, we have a very spoiled Cairn Terrier, named Kylee, who also adores her red ball!! This was perfect!!! And lastly, I am trying to cut out sugared drinks (mainly my sweet tea...so hard). I am not a fan of plain water. 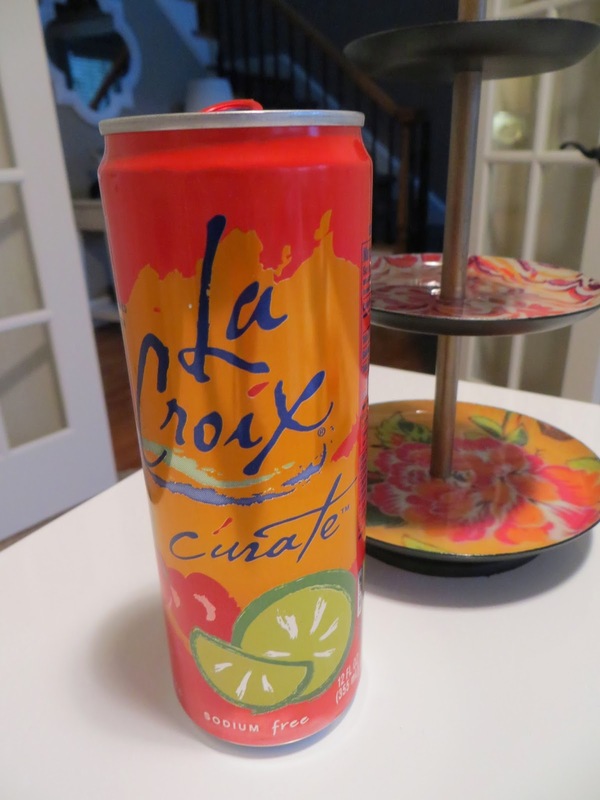 I was thrilled to stumble upon this new flavor by La Croix water. Well, enough ramblings. Hope you have a happy Tuesday!! Well, we all seemed to survive this round of snow and ice. Just a bit left to melt, but the sun is out so it shouldn't be long. Last night I was craving a salad, something a little healthier than the snacks we'd been eating while stuck indoors! I remembered this recipe that a girlfriend gave me years back for Spinach and Pear Salad and decided to pair it with Flank steak. Mix all ingredients in jar and refrigerate. May be prepared 2 days ahead. Combine spinah, pears, dates & pecans in large bowl. Toss with dressing. Add salt and pepper to taste. As I mentioned we served it with sliced flank steak. I doubled the dressing recipe and used half for a marinade for the steak. It turned out perfectly, nice and juicy, and the flavor complimented the salad since I had used the same dressing. This dish would be good with chicken and shrimp as well. Hope you all have a wonderful weekend! Happy Valentine's Day!!! My youngest, who went GF in August, called asking me for some easy recipes. I stumbled upon this one in my Deliciously G-Free cookbook by Elisabeth Hasselbeck. 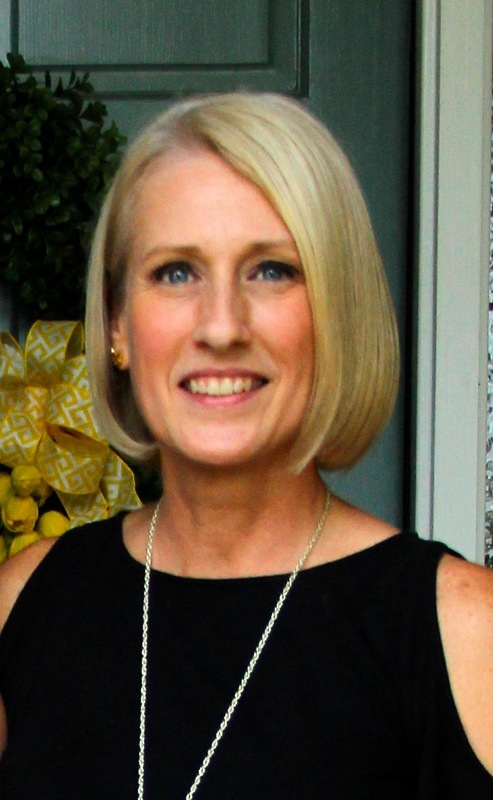 While I had not personally made it yet, I knew she loved artichoke dip and it looked so simple She prepared it the other day, and raved about it. So, of course I had to try it too. She didn't have the paprika that it called for on hand, so she substituted a bit of cayenne pepper and said she liked the kick it gave it. So, I too substituted it as well. Have to agree...so good! 1. Preheat the oven to 425* F.
2. Place the mayo, parm, artichokes, garlic paprika (or cayenne), and black pepper in a large bowl. Stir until well combined. 3. Transfer the artichoke mixture to an 8X8 inch baking dish, and bake for 20-25 minutes, until it is hot and bubbly. Serve immediately with crackers or chips of choice. Doesn't get any easier than that folks! Enjoy.